"A touch of class from the past." Marie's is an original 4-room Victorian adobe structure, built in 1906, known as the "John Rock House". John Rock was the owner of Rock Mercantile during the late 1800's and early 1900's. The house has original floors, ceilings, windows and woodwork. The CALIFORNIA KING BEDROOM is decorated with a Victorian flair. The COUNTRY BEDROOM has a queen bed. A full luxurious breakfast is served at 8:00AM. 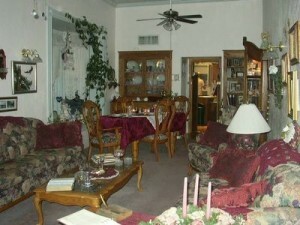 Marie's is within walking distance of restaurants, shopping and many historical areas. A short stroll takes you back in history beginning with Schieffelin Hall, the oldest two story adobe structure in Tombstone. It can be seen from Marie's porch. At the end of the day you'll find Marie's parlor a perfect setting for rest and relaxation. The parlor is tastefully decorated in turn-of-the-century style, complete with a player piano. Of course, with Tombstone's beautiful weather you may enjoy sitting on the front porch or in the courtyard. Marie Dietrich of Tombstone spent most of her time visiting with and enjoying the tourists. She especially enjoyed her days as one of the "Ladies of Tombstone", showing visitors around Tombstone, in full turn-of-the-century regalia, so they could share the feel of the 1800's. Those she met were strangers only once. People loved her gaiety and sense of humor, and fast became her friend. 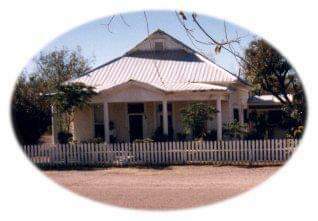 During Marie's life in Tombstone, her home was a gathering place for her family and her many friends. She always showed her love and met each friend with her special smile. In keeping with her wishes, her home is now open to the public by her family, to be enjoyed by those visiting Tombstone. Tombstone is famous for its history. During your stay, be sure to visit all of the fascinating points of interest. A good place to start is the Chamber of Commerce at 4th and Allen Street, where you can pick up a map of Tombstone. Visit the original Courthouse, the Rose Tree Museum, the O.K. Corral and the Tombstone Western Heritage Museum, to name a few... and be sure to take a ride on one of Tombstone's stagecoaches. In the afternoon you may also want to attend a gunfight re-enactment. Tombstone has much to offer, so plan to spend some time with us. If you are planning to visit Kartchner Caverns, advance reservations are required. Reservations (520) 586-CAVE (2283) Call 8 a.m. to 5 p.m.
© Copyright 2019 Marie's Engaging Bed & Breakfast. All rights reserved.